The 25th Innovation and Product Development Management Conference (IPDMC) will be held from Sunday, June 10th to Wednesday, June 13th, 2017, at the Faculty of Engineering, University of Porto in Porto, Portugal. The associated doctoral workshop will take place from Saturday, June 9th to Sunday, 10th June, 2017. The conference has become the focus of important networking among innovation and product development management researchers, for PhD students and junior faculty as well as senior faculty. It is the annual event for researchers in the field and serves as the annual meeting of a virtual society with participants enjoying coming back to meet colleagues. The ambiance is known as friendly and supportive. The 2018 conference is the 25th conference and will mark this special occasion with something extra for participants. In addition to the established annual conference format, this anniversary event will look forward, reflect on achievements and challenge the continuing development of the field of Innovation and Product Development Management through industry enagement, academic keynotes and thematic panels . Combined with the presentation of accepted papers, the conference should provide new opportunities to hear, think and contribute creatively to the continuing formation of our field. Hence the 2018 conference does not have a specific functional or issue specific theme. This to facilitate the inclusive nature of the conference and the community of innovation and new product/service development researchers and practitioners who participate. Submissions covering leading edge topics and new trends are, as always, welcome. Along with ordinary sessions with 20 minutes presentations and 10 minutes discussions of papers, participants are invited to choose to participate in ‘Challenge sessions’. Challenge sessions differ from traditional conference sessions in that in addition to presentating his/her own work, each presenting author reviews one of the other papers presented in the session. Following each 20 minutes presentation, the designated reviewer discusses the paper and asks questions for 5 minutes. The reviewer can prepare one PowerPoint slide to summarize his/her main points or issues. Challenge sessions end with 5 minutes of discussion with the session chair and audience. Challenge sessions provide the opportunity to receive additional comprehensive feedback on manuscripts and presentations. The abstract submission system gives authors the possibility to opt in to have their paper presented in a challenge session. Opting in allows authors to signal their interest in presenting under this format, but is not guaranteed. Panels with well-known and well established researchers and journal editors will debate trends in the field both regarding issues and research approaches. Conference participants will be invited to participate in the panel debates with comments and questions. Keynote presenters will give inspiration and insight for research from practical experiences of innovation and product development management at companies in different industries and locations. Authors submit an extended abstract of about 500 words in length on/before November 4, 2017. This abstract should identify the central research question and theory base for the research, introduce the most important references and describe the methodology, empirical base, analysis, and results. The organising committee responds to the author(s) noting acceptance or rejection of the extended abstract. Feedback is provided in all cases. Some author(s) of accepted abstracts may be requested to address specific perceived shortcomings or omissions prior to submitting final papers. Author(s) of accepted abstracts are expected to submit final papers. Conference registration and participation by the author (or at least one co-author) is required for publication in the conference proceedings (USB key). The　Doctoral Workshop　is an integrated part of the IPDMC conference (since Hamburg in 2008). It will start on Saturday June 9 at noon, with a light lunch, and will continue through Sunday, June 10, ending with lunch. To stimulate academic scholarship, discussions of ideas and dialogue among students and researchers from different countries in the field of INNOVATION AND PRODUCT　DEVELOPMENT　MANAGEMENT RESEARCH, we invite all doctoral students from these domains worldwide to attend this doctoral workshop. PhD students in early and middle stages of their PhD research project are particularly encouraged to participate and present their research proposals, preliminary results and their reflections on issues related to theory, methods and analysis. For students where their PhD dissertation is not planned as a monograph but as a series of articles on a common theme, then the candidate can present a part of her/his work. The whole workshop is very interactive and will give small groups (of typically 4 students) several hours of intensive discussion about their research with a faculty member. Other sessions will be in-plenary,focused on general topics of interest to Ph.D. Students, such as: identifying interesting and researchable topics, publishing your research, and managing your academic career. Students will be asked to fully prepare for the Doctoral workshop, including preparing a 10-20-page comprehensive description of their research (pdf); reading other students’ descriptions; and some pre-course reading from textbook(s). The number of participants is limited to 28 Ph.D. students and those that have attended in previous years have found the workshop to be very rewarding. There is an extra fee of 100€ for participating in the Doctoral Seminar, and registration to the IPDMC is compulsory. Gloria BARCZAK - Professor, editor-in-chief the Journal of Product Innovation Management, College of Business Administration, Northeastern University, U.S.A.
Thomas P. HUSTAD - Professor, Kelley School Of Business, Indiana University, U.S.A.
Porto is the second-largest city in Portugal after Lisbon and one of the major urban areas of the Iberian Peninsula. The urban area of greater Porto, which extends beyond the administrative limits of the city, has a population of more than 1.5 million. The city of Porto and its river, Douro, cannot be dissociated. The Douro Valley, with its lovely terraces of vineyards clinging to the hillsides, is the kingdom of the famous Port Wine and offers visitors spectacular views. Thank you for your interest. We inform that accommodation is now closed. Changes and cancellations to existing reservations must be made by written to Abreu Events (tania.rodrigues@abreu.pt). Changes and cancellations are non-refundable. Porto has a modern airport served by most flagship airlines and most well known low cost airlines.The airport is 10 Km from city centre, that can be reached either by metro ou taxi. Faculty of Engineering is easily accessible by metro, bus and taxi. Some hotels are within walking distance. If you plan to spend a couple of extra days either before or after the conference there are a lot of opportunities for sightseeing range of options for sightseeing in Porto and surrounding countryside, especially the Minho area and Douro valley.You can book tours with Abreu or explore the regions on your own. To conclude the 25th IPDM conference, we have decided to organise a one day tour to the very prestigious University of Coimbra. 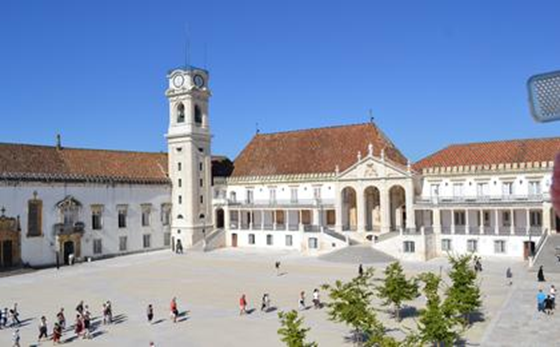 The University of Coimbra is the oldest Portuguese university and for centuries the only university in Portugal. Founded in 1290 by King Dinis in Lisbon, it was permanently settled in Coimbra in 1537, by order of King João III, after a period of migration between these two cities. All Faculties of the University of Coimbra - Theology, Canons, Law and Medicine – began their work in 1544 at the Royal Palace of the “Alcaçova”, later the Palace of Schools. 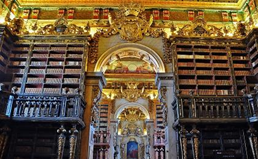 The Baroque Library, built between 1717 and 1728, it is one of the exponents of the Baroque Portuguese and one of the richest European libraries. Will be known as Baroque Library in honor and memory of King John V (1707-1750), who sponsored its construction and whose portrait, made by Domenico Duprà (1725), dominates the space. 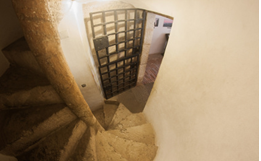 The Academic Prison worked initially in two rooms beneath the “Hall of Capelos”, then in 1559 - since its foundation that the University had, as privilege, its own legal code, apart from the general law of the Kingdom. To this code, the "Private Forum", were subjected all those who in some way were connected to the Institution. This autonomy has allowed the University to have Judge - the Rector -, Guards and Prison. The tour will leave FEUP at 8:30 am to Coimbra (situated at 120 Km away from Porto) . After the visit of the Coimbra University; a lunch at Bairrada region, famous for its roasted suckling pig and wines (typical Bairrada Red Brut Champagne), is planned. Return and arrival in Porto is expected around 5pm. The price for that special day is 50 EUR. Visit of the University, lunch (including drinks) and bus transportation (120km x2). We have reached the maximum number of participants that we can accept, it is not possible anymore to register to that special day ! Cancellations made before May 15, 2018 will be reimbursed minus 20% of the total fee. No reimbursement will be possible after that date.